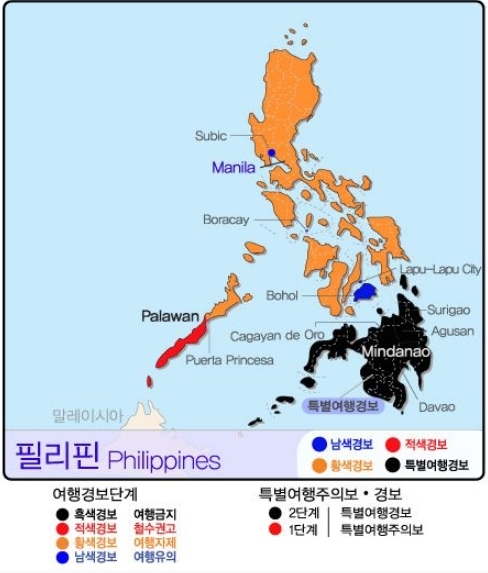 On November 26, the Ministry of Foreign Affairs in Korea issued a Philippine travel ban. The travel ban takes effect on December 1st. This is the first time that South Korea has prohibited its citizens to travel to the country. The places where Koreans should not visit are the following: Zamboanga, Sulu, Basilan and Tawi-Tawi. Last January, a Korean was kidnapped in Zamboanga and was found dead just a few weeks ago. The man surnamed Hong went to visit his son in Zamboanga but was kidnapped by the Abu Sayyaf and taken to Sulu. The archipelago of Sulu is notoriously known as the kidnapping capital of the country. Terrorist groups are known to kidnap for ransom and behead their victims. Remember that the special travel ban is only for the places mentioned and not the entire Philippines. Violators will be subjected to criminal penalties.